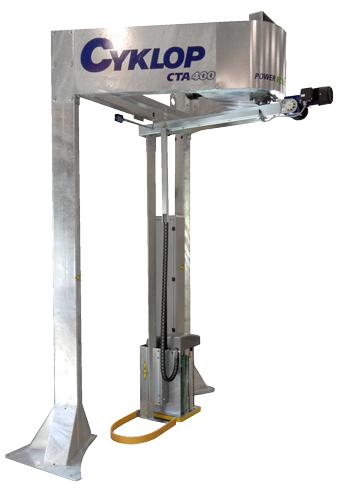 CTA 300 revolving arm machine is a floor mounted stretch wrapper. The CTA 300 is an extremely robust rotary arm wrapping machine, developed with a well-proven technology. Due to extensive possibilities and a variety of settings these stretch wrapping models offer a high profitability through optimal adaptation for every requirement. These characteristics guarantee an optimal transport protection and a reduction in packaging materials. • Easy change of all program parameters and settings. • 9 individual programs can be stored and each program can be named. • All functions of the CTA 300 can be manually operated such as film patterns and film tensions. • All program parameters and settings can be easily monitored and changed with the new colour touch screen. Please note that the daily pallet flows, only indicates to models that might be suitable. Facts like pallet weight, height, configurations, etc. must be considered when choosing the best machine model for your use. Rotary arm speed: Up to 10,5 cycles/min. adjusts on the touch display and the prestretch unit. Operating temperature: 5°C (40°F) to 35°C (95°F) for use in a dry, tempered area. Floor mounting (Min. concrete thickness): 150 mm. 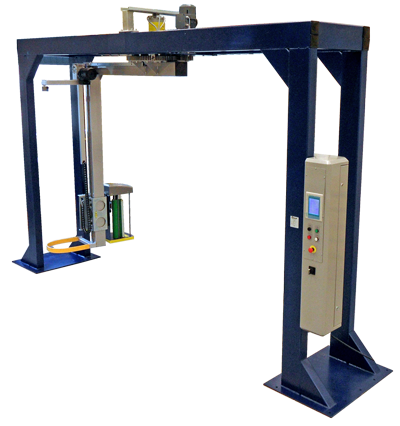 All Cyklop machines can handle film thicknesses 9-35 microns in both blown and cast qualities, pre-stretched or regular. Please note that the best package quality and lowest cost per pallet will always be obtained by using high quality films regardless of the film thickness. Operating voltage: Single phase 240V, 50 Hz.